for any update to the meeting start time and agendas. 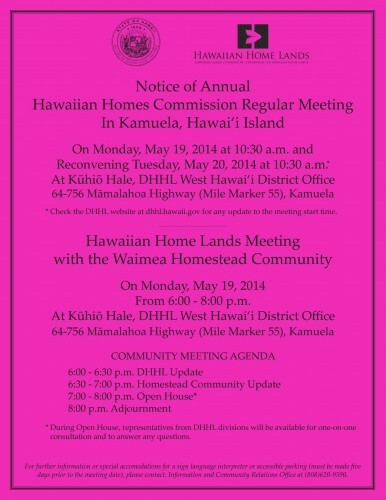 From 6:00 – 8:00 p.m.
* During Open House, representatives from DHHL divisions will be available for one-on-one consultation and to answer any questions. For further information or special accomodations for a sign language interpreter or accessible parking (must be made five days prior to the meeting date), please contact: Information and Community Relations Office at (808)620-9590.